A very important part of your Porsche suspension system is the control arms. 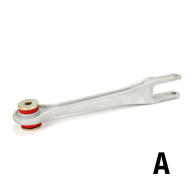 The control arms manage the motion of the wheels in relation to your vehicle's body. A worn or bad control arm will cause too much movement and make for an uncomfortable drive, not to mention the wear and tear that worn out control arms cause to the rest of your Porsche’s suspension system and tires. At EPS our team of technicians has developed replacement upgrades for your Porsche Control Arms.